Choosing a wheelchair for your child is a tough decision, undoubtedly, and that's why Sportaid offers wide variety from Colours that let you make wise decision while choosing the safest and most comfortable options for your child. A child's mobility and independence are significant factors to consider, so it is important to get the right wheelchair. Our collection of Youth Wheelchairs from reputable brands like Colours has us excited, and we expect it will affect you the same way. 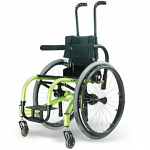 Colours youth wheelchairs are known for its various growth capabilities and offer a lot of other quality features. Our collection safe and durable collection of Colours Youth Wheelchairs includes the Colours Saber Jr. Youth Wheelchair, Colours Razor Blade Jr. Youth Wheelchair, Colours Little Dipper Youth Wheelchair, Colours Krypto Youth Wheelchair, Colours Chump Youth Wheelchair, and the Colours Chump-G Youth Wheelchair. Colours Youth Wheelchairs have the simplicity, durability, and strength you have to have in a pediatric chair, with a growth program that allows the chair to grow as the child grows. And with our Low Price Match Promise on all wheelchairs you really will come out a winner big time! Feel free to call 1-800-743-7203 for help purchasing your wheelchair today. You'll be glad you did! Save 30% when you buy your Colours Youth Wheelchairs from Sportaid! Our most loyal customers have been enjoying our satisfaction guarantee for years, and we are extending to newer customers as well. The 25 year experience of helping people find Colours Youth Wheelchairs at the lowest prices has made us the industry leader! Our inventory is home to an impressive collection of wheelchair cushions, wheelchair parts, and wheelchair accessories, and we are fully prepared to beat any competitor's advertised price, with one call from you! Our customer service staff has over 50 years of experience, plus over 90 years of combined wheelchair use experience. We look forward to working with you!